Johnson Control Hitachi is a global air conditioner manufacture. It established itself as joint venture in 2015 since then its growing like leaps and bounds. The company has a wide range of variety for both window and split AC. They are designed using the newest global technology to work efficiently. Their cooling power is absolutely bliss especially during the months of May-June to beat the summer heat. If you are planning to buy the best Hitachi AC in India, then you are at the right place. In this article, we are covering the best of best ACs from them. The products chosen by us are best in terms of cooling efficiency, price, features, modes, material quality etc. Down below you will find information that will tell you about the newest technology used in these ACs. There is information on some of the specifications to give you a better idea. All these advanced technology had lead them to fall in the category of best AC in India. Refrigerants are a major cause of ozone depletion. So, keeping this in mind Hitachi ACs come with Eco-friendly refrigerants to reduce the depletion of ozone layer. The Hitachi AC uses R-410. R-410 is a hydroflurocarbon which aims to cause zero ozone depletion. Not only this, this kind of refrigerants have a better heat exchange rate and a much faster cooling rate then the traditional refrigerants. The new model of ACs come up with expandable inverter technology. This was designed keeping in mind the tropical weather in India. These expandable technology aids to control the heat ad humidity both. The company suggests with this technology the AC provides 10% better cooling performance, 20% better humidity control, and 60% faster cooling. Hitachi AC are designed keeping in mind to cool the entire room. In ordinary ACs, there is a two way direction air flow with the swing moving from up and down only. This way they fail to reach in the nooks and corners and on sides of the room. To find a solution to this, the Hitachi ACs come up with four directional air flow which is done vi the 4-way swing. This 4-way swing moves up and down and left and right to let the air reach every nook and corner and on the sides too. This aid in uniform cooling of the room and also avoid hitting of the air on your directly. Hitachi is known for its customer satisfaction. The ACs from this company are send to the market only after qualifying their rigorous quality testing. After being manufactured, the ACs have to pass 43 quality tests. This makes sure that the AC is fully operational and is without any defect or damage. All this is done before handling to the dealers or the customers. So, be rest assured ACs from Hitachi would be absolutely defect-free when delivered. Most of the good models of AC have top-notch filters. 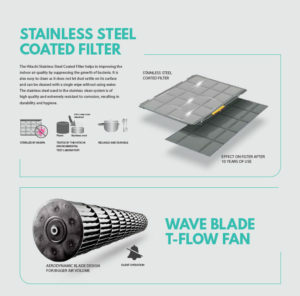 It has stainless steel coated filters. These filters suppress the growth of bacteria and are extremely easy to clean. You can clean them with a single wipe without using water as it does not let the dust settle on it. Further, the system is of high-quality and corrosion-free. This also enhances the durability and hygiene of the filters. Sleeping in a hot room or a very cold room both is impossible. In ordinary ACs, once you on them, the temperature of your room keeps falling which makes the room extremely cold and eventually disturbs your sleep. Looking in to this situation, Hitachi ACs have come with an isleep technology. When the AC is in this mode, first it works to cool the room by increasing the fan speed and refrigerant power. Next, once the room is cooled, the AC slows down the fan speed and goes in the auto-mode to maintain the temperature and thus excess of cooling in the room. This way you not only get an undisturbed sleep at night but also you get few more benefits too. The other benefits include power saving, you wake up fresh in the morning, and cooling wastage is avoided. This comes first in our list due to its energy efficiency rating and great functioning. Hitachi Kashikoi is 1.5 ton inverter split type AC. It fits well to room size of 120-200 sqft well. It has wide angle deflectors and wave blade design to let the air flow in every corner of the room and thus provide uniform cooling even at a temperature as high as 55 degrees. Further, it has soft dry technology to remove any kind of odor from the room. You can operate this AC without a stabilizer. The AC works well if in area there is a voltage fluctuation problem. The AC works well for voltage between 130-220Volts. In case in your area, the voltage is beyond this range than you might need a stabilizer. Other features include dust filters, sleep mode, tropical inverter technology, 100% copper wires, and eco-friendly refrigerant. This one is another amazing product from them with all the required specifications.Hitachi MERAI is a 1.5 ton AC that fits to any room size between 110-190 sqft. 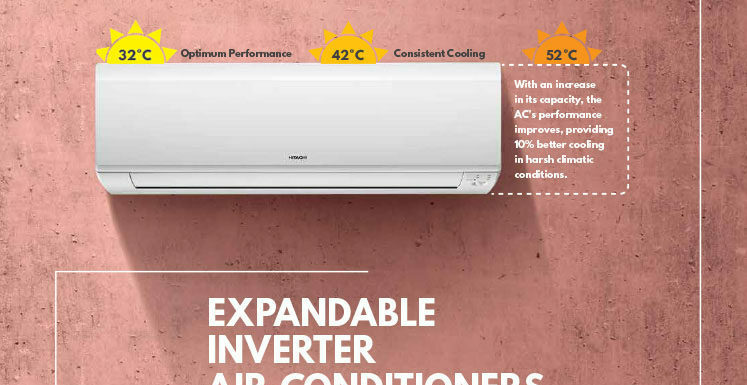 This AC also falls in the range of expandable inverter ACs. Merai is designed to cool 60% faster because of its wave blade design and wide angle deflectors. Further, the tropical compressor fights well to remove heat and humidity from the room. One of the distinguishing feature is the filter clean detector which tells you when to clean the filters. This way the maintenance becomes a hassle free task. Other specification include soft dry technology to remove bad odor, auto-fan speed, timer, backlight remocon, etc. This is one of the hottest selling model from Hitachi. It is in demand because of its reasonable price and standard cooling capacity. Hitachi Sugoi is a 1.5 ton 3 star split AC. The amazing feature in it inner grooved copper tube. These tubes assist in quick and optimum refrigeration flow. The increased surface area provides better heat exchange rate and superior efficiency at all times. It works on a super silent mode at all times. Another good feature in this is if the compressor is cut off the fan speed is low and when the compressor starts then the fan speed is high. This makes its operation hassle-free. Th other few specifications of it include are cool mode, soft mode, backlight remocon, filter clean indicator, etc. If you are looking for a window AC from hitachi for your medium to large size room than this can be a good option. Hitachi Kaze plus 1.5 ton fits to any room size of 121-179 sqft. The AC has world best class copper condenser for efficient cooling and for enhanced life of the unit. The amicable feature in this AC is auto-climate technology that detects the heat and humidity and then guide the fan and the compressor to work accordingly. The AC undergoes 43 rigorous quality test before reaching this stage. so, be rest assured you will get a great quality product. The other features of Kaze plus include on/off timer, auto-restart, auto-filter clean indicator, powerful mode, auto-fan speed etc. If you are looking for a small window AC this can be a good choice. Hitachi 1 ton Kaze plus window AC is solely meant for small rooms with an area of 0-120 sqft. The best feature of this is the energy efficient rating. You won’t get a 5 star rating AC in this price bu Hitachi is offering you. It is designed using world class copper condenser wires for a long life and effective cooling. 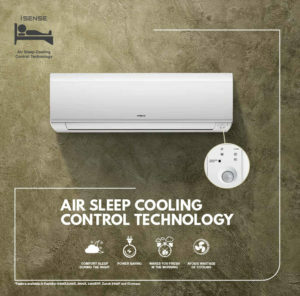 Moreover, it has Kaimin and auto-climate technology that lets the AC to adjust the temperature to increase automatically by one degree after every hour to maintain the comfort level. This way your room will be never too cold or too hot it would be just apt for you to relax and enjoy. Lastly, it has koukin filter, dust filter, auto filter clean indicator, auto-fan speed, on/off timer, dry mode, power save mode, etc. Hitachi air conditioners are capturing the Indian market at a high rate. 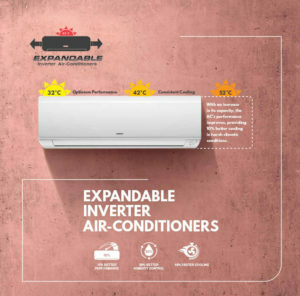 Their ACs are loved in India because of their tropical inverter feature that balances out the heat and humidity level well especially during the monsoon months. This is not only tested by us but also on various other sites when we searched for Best Hitachi AC reviews. Hitachi have all the basic, moderate, and high-end models in the range of split, split inverter, and window ACs. All the models work phenomanal even at the highest temperature and have a remarkable top-notch quality. But the best of the best ones from them are listed above. Our list is not made randomly but it is made after rigorous testing and research. So, be rest assured if you choose any one from the above you will be completely satisfied.